In this country of ours where the Christmas carols start playing as soon as the so-called -ber months set in, it is frequently overlooked that the last quarter of the year – October and November, in particular – is the most perilous for this country weather-wise. More weather disturbances spawn in the Western Pacific in June and July, traditionally regarded as the height of the rainy season in the country. By August, the number begins to taper down. Thus, the usual thinking is that the worst of the typhoon season has passed and everyone begins to look forward to the holiday season, especially with the carols playing incessantly over the radio and even inside the malls. Statistically, however, the months of October and November are when the Philippines are likeliest to get hit by weather disturbances. Then, of course, like anyone needs to be reminded, last year the dreaded Haiyan – local name Yolanda – tore across the country with heretofore unknown winds in excess of 300 kph and is regarded as the strongest super-typhoon in recorded history. From June to September, it is the southwest monsoon blows through the country. Hence, although more systems spawn in the Western Pacific during this period, the southwest monsoon winds allow these to follow their natural course northwest or north northwest. This means that while the Philippines get hit once in a while, a fair number of these also move towards Taiwan or Japan, instead. The reversal of the monsoons around October, while this brings colder temperatures to the country, also tends to push weather disturbances on more westerly or southerly tracks – and therefore right where the Philippines are. From 1945 to 2010, the Philippines were hit by a total of 88 weather disturbances in the month of November and 83 in the month of October. In contrast, there were only 70 hits in the month of July for the same period. Moreover, the really nasty howlers rather tend to also hit the country during the months of October and November. During the same period, the Philippines were hit by a total of 15 Category 5 typhoons in October. 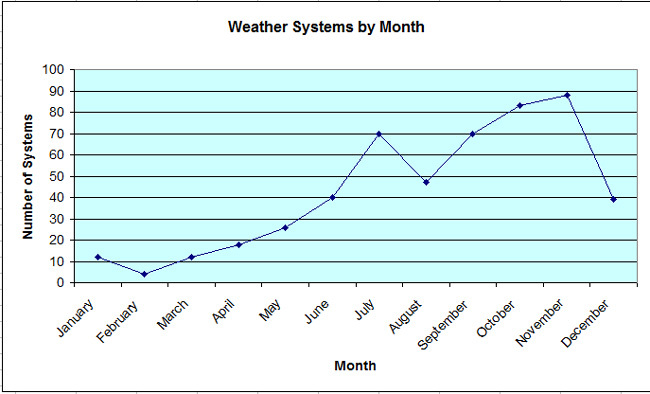 Weather systems that hit the Philippines per month from 1945-2010. These are typhoons with peak winds of 249 kph and above, really nasty. November, on the other hand, was the month when the country was hit by the most number of Category 4 typhoons – 210 to 249 kph winds – during the same period with 19 hits. A Category 4 typhoon is still very nasty, as is still fresh in my own mind after the passing last July of Typhoon Glenda. PAGASA said it was 180 kph. I think this figure was understated and it was more in excess of 200 kph. Since 2010, things seem to have gotten worse, something that appears to be a direct consequence of global warming. The strongest typhoon to ever hit the island of Mindanao was Bopha, local name Pablo. 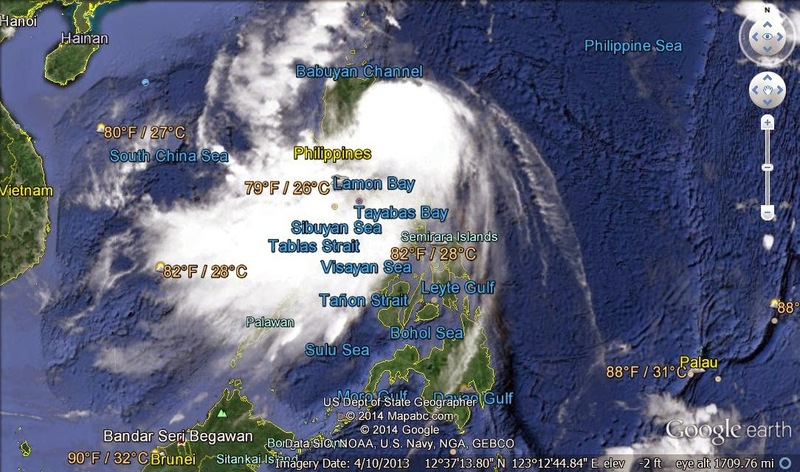 The system hit northern Mindanao as a Category 5 super-typhoon on the 3rd of December 2012. This system formed, however, on the 25th of November. So! Looking forward to Christmas, were you? First join me in praying that God will give our country rest from these really nasty howlers in the next few years.